Chris' dad Larry came to visit in Aug. I wanted to make something home made and comforting for dessert. 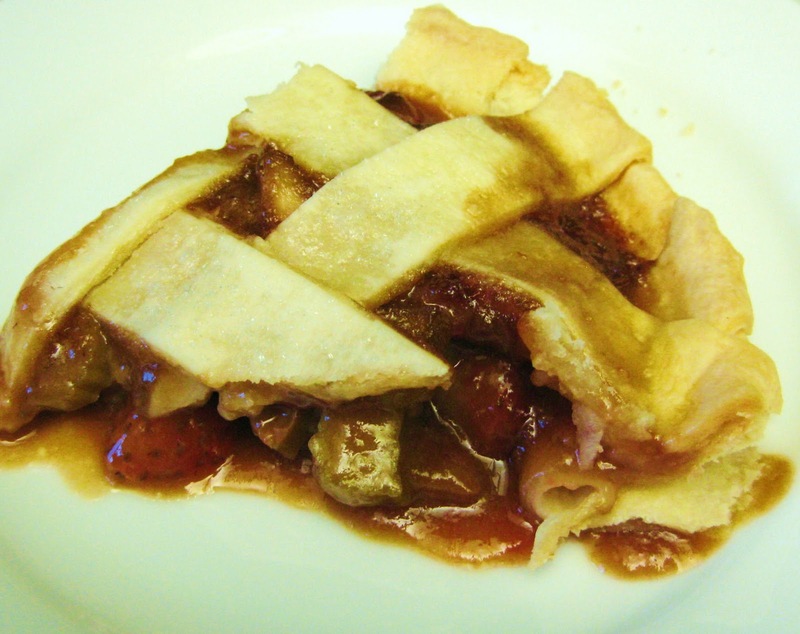 I had starred Mom's email that came through months ago with the subject line: Grandma's Rhubarb Pie. The time had come. Chris said he had never had Rhubarb. He probably did at some point at his own Grandma's, but doesn't remember it, probably passing it up for Oreos or some other kid preferred dessert. But it was time for his adult palate to explore this tart mystery stalk. Never really been one for "slaw on the side." But Fruit Slaw is something I can work with... and have seconds. It's a little tedious with the chopping and julienning of the ingredients, but it's a real cloud pleaser for adults and kids. Healthy too! I was inspired by Bon Appetit's "Stone Fruit Slaw" but seeing it was late summer, I found the stone fruit to be a little more ripe. I wanted that crisp bite to accompany my dinner. If you decide to experiment with stone fruit (i.e. nectarine, plum, peach) make sure they are a little under ripe and firm. This makes for better slaw. No body likes mushy slaw. Might as well do a smoothie.